It is well known that support from France helped secure the American victory against the British during the Revolutionary War. The import of weapons, to include thousands of “Charleville” muskets, proved crucial in solidifying France’s commitment to American independence. It also filled a shortage of arms in the colonies due to Britain’s gun control program that included a 1774 import ban and later confiscation on firearms and gunpowder. Along with the Intolerable Acts, American patriots saw the confiscation of arms as a major offense that contributed to the outbreak of war in April 1775. In 1776, the Continental Congress formed a secret committee to purchase weapons from France. By 1778, when France openly entered the war, they were shipping muskets directly to America. The example featured here is a French .69 caliber M1728 Infantry Musket popularly referred to as a “Charleville” musket. It will be on display in the Founding the Nation Gallery of the National Museum of the United States Army. The exhibit consists of 18th century weapons and objects that highlights the “Beginnings of the Army” during the Revolutionary War. The M1728 Musket first found its way to America during the French and Indian Wars in 1754. What is unique about this particular musket is that it is the only known example related to the state of Delaware. The barrel is marked on the face with “DEL. State N.C no 94” and the wood stock is branded “DEL. STATE N.C.” These markings refer to the State Arsenal in New Castle, Delaware, which still stands today. Such a weapon would have been manufactured in one of three French arsenals: Charleville, Mauberge, or St. Etienne, with the most being produced from the latter as it was popularly referred to as the “St. Etienne” musket. 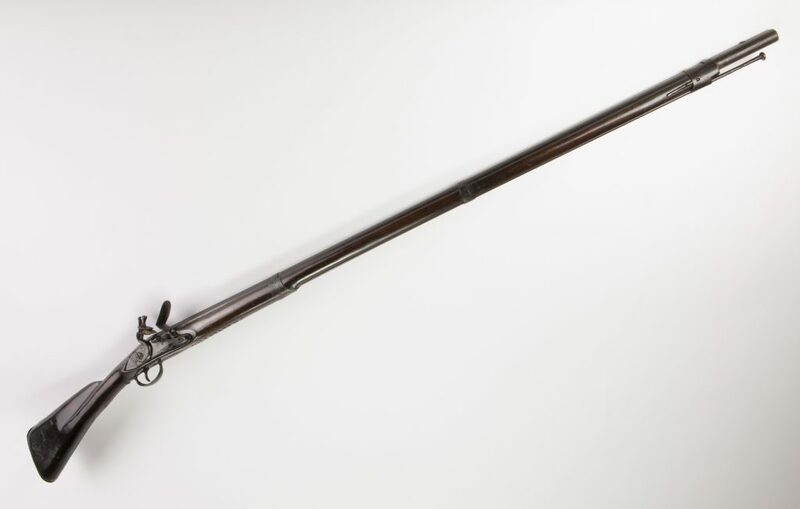 This model was the second version of the Charleville musket, which was first adopted in 1717. The main difference between the two was the barrel of the M1728 was attached to the stock by three bands rather than just one. This modification became the standard for all versions that followed. Later on the M1763 “Charleville” musket served as a model for the first American Springfield musket made in 1795. A total of 375,000 of this type was produced in France, but it is unknown how many came to North America. What is known is that the “Charleville” Musket was a key weapon for American Soldiers and a fitting symbol of France’s unwavering support of America’s fight against colonial rule.